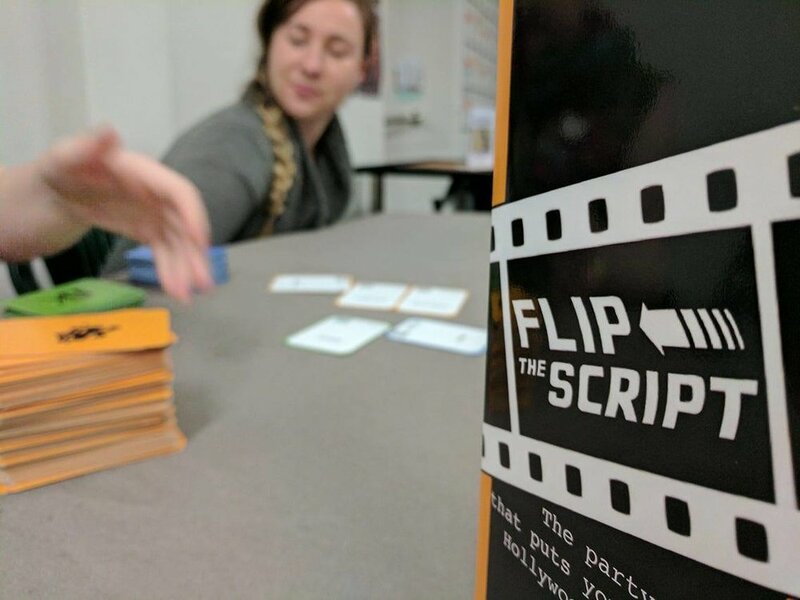 Coming soon to a table near you, this is Flip The Script, a plot-making party game for 4 or more aspiring producers that is currently being funded on Kickstarter. Designed by Mark Seymour, the game blends your favourite actors, actresses, genres and themes into a bizarre movie smoothie, but does it taste delicious? Sit down, grab your popcorn, and read on to find out! ‍‍Gameplay is simple! To start a round, deal cards to each player (three cast, one genre, and one theme) and set a countdown timer for 3 minutes. Now start scribbling, because you only have until the clock hits zero to come up with the next summer blockbuster based on the prompts you’ve been dealt. You’ll need a title (puns preferred), a plot (duh), and the key characters that will feature in your work of genius, but the more details you can come up with the better. BEEP BEEP BEEP, time’s up and now you have to convince your friends that your movie is clearly the best. Starting with the player left of the dealer, each player gets a chance to pitch their idea to the group. This is your chance to sell your ridiculous idea, so don’t be shy! After all the pitches, everyone votes for their favourite movie - if you receive the most votes, you win the round! Keep a card in front of you as a trophy, discard all other cards from the round, and start again from the top. There isn’t actually a rule for how the game ends, so your group can choose how long to play for. We decided to play “First to Three Points”, but you could also just play until you decide to move on to another game, or you fall asleep at the table mumbling new film plots under your breath. ‍So is Flip the Script a fresh tomato or a box-office flop? I had a great time casting some of my favourite actors in absurd roles, inventing preposterous plots to pitch to my friends, and helping others embellish the details of their stories. The game was a great experience, and it tested our wits and creativity as we were forced to create interesting stories out of unlikely card combinations. The highlights of our games included a dystopian children’s film titled “The Mermaid’s Tale”, an inspirational movie titled “Blood Bowl” about an all-vampire baseball team that wants to make it in the big leagues, and a Cold War musical called “My Fair Comrade”. Not every film we created was a stand-out hit, but watching someone flounder trying to mash their cards together was usually just as amusing as a cleverly crafted pitch. The game also includes some rule variants depending on how your group enjoys playing, including playing in teams of two. Playing in pairs is a great addition to the game, as it gives you someone to bounce inspiration off and helps bring less confident players out of their shell. 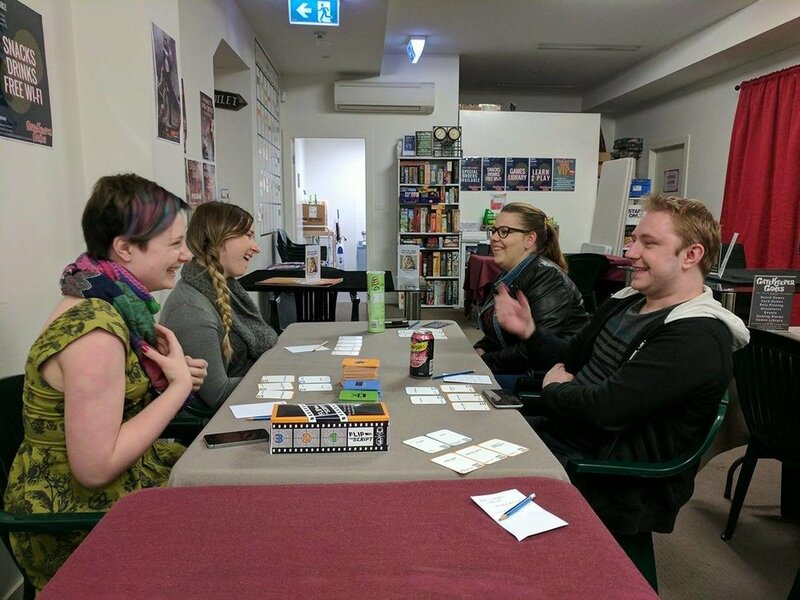 Like many party games, Flip the Script shines when you play with outgoing personalities and where the players know each other well, because the dynamic and energy of the group can truly make or break this game. When everyone feels comfortable sharing all of their absurd ideas, the game is incredibly engaging. You get drawn in by the hilarious stories, and it becomes more entertaining as you play off each other’s ideas and try to upstage the other pitches. ‍‍However, this definitely isn’t a game that will suit everyone. The pressure to be inventive and funny can be intimidating for some players, especially since the game requires you to put in a reasonable amount of effort if you want to create a pitch that stands out. If your group is struggling with inspiration you can add a few house rules to make it easier to play, such as giving players more of a structure for what to include in their pitch or shortening the rounds so that players feel less pressure to come up with something absolutely incredible. Also, even though I have thoroughly enjoyed the games I’ve played, I’m not sure how replayable Flip the Script is. There are only 25 unique themes and 20 different genres included in the game, so it’s possible that you’ll quickly see all of the combinations that the game has to offer or that the same cards will start to feel tired. This will obviously depend on how creative your group is - some players may be able to invent brand new storylines for similar combinations while others will fall back on old tropes. Some of the cards are also difficult to use if you get the wrong combination. Some themes in particular feel out of place in a party game (such as “American Civil Rights Movement” and “American Civil War”), while others feel vague or fall flat (“Geeks / Nerds”, “The Tudors”, “The Renaissance”). I would have loved to see a wider variety of genres and themes in the deck to allow for more possibilities, and more jumping off points for players to draw inspiration from. 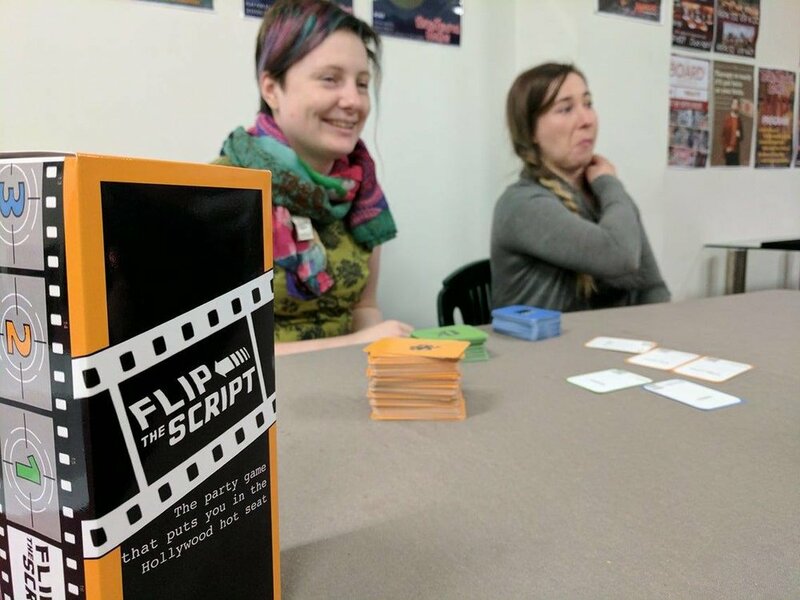 Flip the Script is a great game for catching up with friends, and enjoying a weekend in with a bottle of wine. It’s easy to learn, hilarious to play, and you’ll be left with the memories of that one film that you really wish actually existed. It puts an interesting twist on the pitching party game theme, so if you already enjoy games such as Superfight and Bad Medicine then I definitely think that you should check it out! If you think Flip The Script is for you, you can find the Kickstarter campaign here! As always, thanks for reading! If you enjoyed this post, please consider sharing it with your friends and following me as @CardboardVault on your social media of choice.